Arguably one of the world’s most ancient dog breeds, the Basenji’s history is believed to pre-date the Ancient Egyptians of 3000 BC. It is uncertain exactly where the Basenji came from, although there is evidence to suggest it was once native to central Africa, where it was used as a flushing and retrieving dog. Otherwise known as the ‘African Bush Dog’ or ‘Congo Dog,’ the name ‘Basenji’ translates to ‘small wild dog of the bush,’ which supports the suggestion that these animals originated from the African rainforest. The Congo Pygmies are credited with breeding and distributing the original Basenjis, as well as harnessing their unique, hunter-gatherer skills. If this theory is to be believed, it is likely the Basenji was utilised as a forest guide, for flushing and retrieving small game, and for warning of approaching predators. Its small, athletic build and lack of bark gave it a great advantage over other dogs of similar capability. If the Pygmies were to eat that night, they needed a dog that could work efficiently, and silently, without tiring or putting the tribe at risk. The Basenji was ideal for this and proved its worth time and again, being prized by the locals for its intelligence and aptitude. Often referred to as ‘m’bwa m’kube m’bwa wamwitu’ in southern Sudan, meaning ‘jumping up and down dog,’ the Basenji had many unique traits that made it more proficient for the purpose than other doggy candidates. From Africa, the Basenji slowly made its way to Egypt, either through migration or by being gifted from the Pygmies to the Pharaohs. It is clear the dog has very definite connections with Egypt, where it is heavily depicted in records, engravings and ancient hieroglyphics. The Great Pyramid of Khufu – constructed around 2700 BCE - boasts paintings of Basenji-type dogs, seated at the feet of their owners. In 6000 BCE, further rock and cave drawings depicting Basenjis (or, at least, dogs aligning with our modern perception of the breed) were discovered in Libya. The European fascination with the Basenji began in the late 19th century when people started talking about its unique qualities and its handsome physical form. Everyone wanted to own a ‘barkless dog’ that acted more like a cat and was void of all unpleasant smells. Many efforts were made to import the breed to England although disease claimed the lives of the dogs before they reached land. Some dogs made it onshore, only to perish a few days later. Distemper was primarily responsible for these losses. In 1936, the first successful Basenji imports were made by Mrs. Olivia Burns. On a visit to her husband in the Belgian Congo in 1929, Mrs. Burns fell in love with the native dog and decided to return to England with five of them. Unfortunately, all but one died of distemper after being wrongly vaccinated with a live vaccine. A pair imported in 1936, Bongo and Bokoto, survived the journey and became the founding parents of the English Basenji we know today. The pair was first exhibited by Burns at Cruft’s Show in 1937 and they caused such a sensation that security was manned to keep the public moving past their cages. Such was the interest in these dogs that Burns was inundated with questions and requests for puppies. 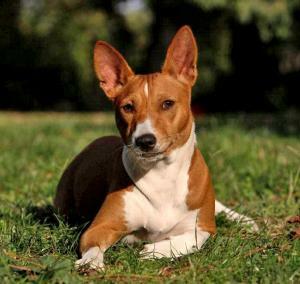 Today, the Basenji is relatively uncommon in this country, although there still remains some good examples. The breed's popularity has declined in the past decade, with people favouring a different type of companion dog. However, the novelty of a barkless dog that smells and sheds very little, remains with many people, something which has contributed to the breed's enduring survival. - Due to the flat larynx of the Basenji, it is physically unable to bark. This has worked massively in its favour over the years, whether in hunting or the household. - The Basenji falls within the ‘hound’ breed group, sharing its classification with the Bloodhound, Whippet, Greyhound and Beagle. - Despite its ancient history, the Basenji has only been officially recognised as a breed for 60 years.